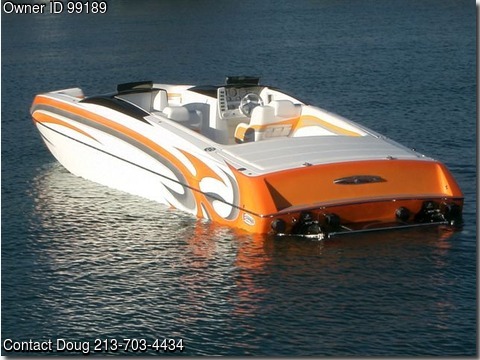 Boat is located in Havasu Lake,California.Please contact the owner @ 213-703-four four three four or doug.auslander@gmail.com...2007 E Ticket 29' Luxury Cat - twin 525, loaded and clean! Boat is available to see thru the manufacturer. Options included: Mercury Stainless Propeller, Bimini Top, Engine Bay Storage box, Billet Speaker Covers Standard features: Oversized Driver and Passenger Bucket Seats Billet and Stainless Steel Seat Mounts Plush Seating for 12 adults Cabin (over 40 cubic feet) with Door, Bunk and Corian Top Towel Storage High interior Side Walls provide secure seating for smaller family members (2) Aluminum under seat Trash Receptacles 11 gallons each. (Accepts large disposable trash bags) Massive Entertainment Area (over 73 square feet) with Plush Seating Massive Padded Sun Deck (2) Forward Facing Contoured Sun Lounges with Drink Holders, Stowage and LEDs E-Ticket Billet Aluminum Swim Platform with Non-Skid Inlays 100% non-skid flooring throughout (Available two tone) (3) Carpeted Under Seat Storage Area (over 12 cubic feet) One-Off Gel Coat Design Graphic Sony CD Player - Stereo with Drivers Wireless Remote Billet Speaker Grills and Head Unit Mount to match motif of boat Four JL Speakers Built-in Ice Chest (Optional) Corian Cup Holder Tops W - Billet Stands Corian 12) Drink holders (Large plated type) (17) Red LED Hella Interior light (4) White LED Hella Cabin Interior Lights LED Navigation Lights with Billet Bezels Livorsi Monster Gauges with faces and bezels to match motif of boat Livorsi Monster GPS Speedometer with Recall Corian Storage Top In Cabin Livorsi Throttle - Shifters Dino Steering Wheel Imco Full Power Steering and Helm Mercury Four Blade Lab Finished Propellers All Stainless Steel Hardware and Fasteners Stainless Steel Plug-in Cleats Engine Bay Work Light Stainless Steel Rub Rail Hand Finished Engine Bay with Hi-Gloss Gel Coat Finish to match motif of boat (2) Bilge Blowers (2) Billet Bilge Blower Pop-Up Vents (2) Automatic Bilge Pumps (2) Group 24 Batteries (2) Aluminum Battery Boxes (2) Battery Disconnects (2) Billet Big-Mouth Fuel Fills Design and Construction: Proprietary Five Step Bottom Vinyl Ester Resin 100% Soldered Wire Connections Five Year Hull Warranty Increased Air Entrapment Hull (9) Total Balsa Core Bulkheads Vacuum Bagged foam core hull & deck sides Through Bolted Rub Rail (Trim around boat) (2) 75 Gallon Foam Encapsulated Fuel Tanks Color Matching Powder Coating Standard Performance: Large 29 length and 92 (110) beam provide super fast planning times and an unbelievably smooth ride in rough water Our Propriety Deck offers the most room in its class with comfort and safety Our radical Five Step Bottom provides a stable ride and precise turning in all conditions. Original Owner, Always garaged and well cared for. Twin Mercury Racing 525, (130 hrs), XR Drives with sportmaster lower, Custom tail pipes with Gibson Mufflers, IMCO Full Hydraulic steering to helm. Includes all E Ticket standard features plus 2-tone non-skid flooring, built in ice chest under rear seat, sea strainers, stage 5 stereo sytem with all billet speaker grills, Honda 2000 generator, inverter and 2150 Stinger battery, Bimini top, boat cover. Sitting on Custom Extreme trailer (triple axle) 20" tire - wheel package, stainless fenders, LED Lighting package, drive cage, walk on decking. Priced to sell at $139,000 Located at E Ticket Factory in Lake Havasu City AZ. Please call for more info or to see, this boat is stunning!